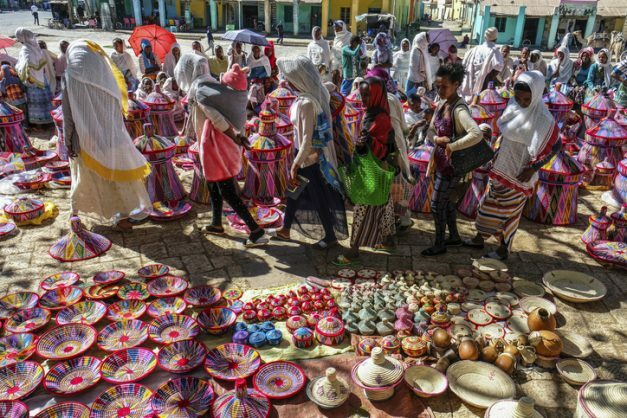 AKSUM, ETHIOPIA - JANUARY 13: Ethiopian women selling baskets in the Aksum basket market on January 13, 2018 in Aksum, Ethiopia. Image: iStock. When a black man called Ras Tafari was crowned, many saw it as a sign of a prophecy had come true. The African Union (AU) is paying tribute to Ethiopia’s last emperor, Haile Selassie, by unveiling a statue of him outside the AU’s headquarters in the Ethiopian capital Addis Ababa. The statue outside the $200 million building is in recognition for the role Selassie paid in establishing the AU’s predecessor, the Organisation of African Unity (OAU), the BBC reported on Sunday. But there is much more to the legacy of the late Ethiopian emperor than his efforts towards helping to establish the predecessor of the AU, which he did after more than 30 years in power. Selassie is strongly associated with the late Jamaican singer Bob Marley and Rastafarians. Many Rastafarians worship him as a god, but how did this happen? Selassie’s coronation took place in 1930. Ten years earlier, however, a Jamaican black rights campaigner Marcus Garvey made a prophecy about a black king who would be crowned “for the day of deliverance is at hand”. In East Africa, Ras Tafari ( “chief” Tafari) became Haile Selassie (“power of the trinity”). Almost 12,874 km away in the West Indies, Selassie became God (or Jah) incarnate – the redeeming messiah – and Ethiopia, the promised land, the BBC reported. In short, the Rastafarian movement was born. While it remains unclear whether he believed this himself, Selasie nevertheless didn’t try to dispel the Jamaican movement when he visited the island in 1966. When he died in 1975, his immortality as a god was questioned by Rastafarians and Ethiopians as debate arose over whether he had done more good or bad for the Horn of Africa country, especially in light that Garvey had actually been a critic of the emperor and not a believer. A Human Rights Watch report accuses him of acting with “official indifference” to famines in various regions of the country and attempting to conceal the famine of 1972-72, in which an estimated 200,000 people died. He is also known to have violently cracked down on people who opposed him during his reign and was later labelled a dictator. But his supporters counter that he was not only a moderniser but was also the first African leader to become a global figure on the international stage.